HOME 30 Years of Great Skiing! Visit us on Facebook. Our Facebook Page is open for you to contribute photos, ski news or upcoming events. The Morice Mountain Nordic Ski Club was incorporated as a Society in 1987. The club manages ski trails in the Morice Mountain recreation site 8km south of Houston on Buck Flats Road under a management agreement with the BC Recreation Branch. The trail system has varied terrain with easy, moderate and difficult trails. The club manages approximately 35km of trails containing an extended 5km dog compatible trail loop that covers easy and moderate trails, a 2km length of lit trails (Location of Trail Light switch) for night skiing, a ski playground and adventure trail system for the kids, and a cabin at the 1300m elevation on the east slope of Morice Mountain accessed via a 7.7km trail from our trail system. UPDATE FALL 2018: Lit staging area only. Trail Lights not functioning. The bottomless money pit will not be filled. Please use a headlamp. Special purchase arrangement for skiers who wish to night ski: MMNSC will pay 1/2 of your headlamp! Fall 2018: Hard to believe!!! We have another NEW dog trail!!! 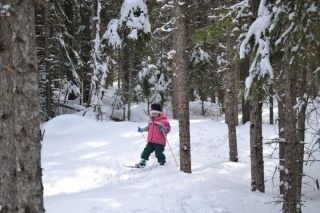 GOLDEN BOW - 1.4 km in to turn around - beautiful rolling trail with good, cold snow, big trees. 2018 - no need to turn around - Paradise Bridge takes you to Sawmill Pass. TOP DOG - We now have 3 dog trails providing gentle hills and variety for dogs and their folks. Trespass, the center trail of the Dog Trio, is also Dog Friendly to the Moose Swamp turn off. Dogs not allowed on Trespass beyond that point, but you can go up Moose Swamp to the turn around point which is marked and just beyond Moose Arch. MOOSE MEADOWS wider, several trails improved drainage and weed control, and a few other good surprises! The majority of our trails are groomed by a Bombardier 400 Plus to a minimum width of 17ft with two outside set tracks and one interior skating lane. All trails are two way traffic. If you don’t have skis, come and use our AMAZING SKI LIBRARY service. The Club has 60 pairs of skis, boots, and poles to fit small kids to the largest adults. The cost is $5 per item, or $10 for the full setup, if not an MMNSC member. It should be noted that not all the equipment may be available at any one time due to season rentals by Jackrabbit Skiers. Click here for Google Map to trail parking lot and downloadable map of ski trails.